This entry is part of my year-end, month-long Reverb 11 blogging project, where I reflect on my year in a series of daily blog posts. Today I am writing on FOOD: What was the best meal/culinary experience you had this year? What made it so great? I have two answers for this question, one emphasizing the “culinary” and the other the “experience” part of the phrase. For exquisite deliciousness and a reminder of the magic and sensory delight that a beautifully prepared meal can provide, any meal I had this year at Longman & Eagle in Chicago fit the bill. Whether it was a robust hamburger, a delicious corn risotto or one of their unpretentious yet potent cocktails, Longman & Eagle never let me down. Any time someone visited Chicago and was looking for great restaurant recommendations, I always put this gastro-pub at the top of the list, not just for the food (often locally source and impeccably prepared) but for the friendly staff as well. And now I’m telling the world officially: this is a great place to eat in Chicago. Go early, or go late. My favorite experience around food this year had nothing to do with the quality of it, and much more to do with quantity. It was on my recent trip to London, which was set to take off from O’Hare very early on a Saturday. I do not know why “they” recommend getting to the airport two hours ahead of takeoff, but I was bleary-eyed and up before dawn. But it left me enough time for one of my rare traveling pleasures, which is getting to eat at the Macaroni Grill in Concourse H/K at O’Hare. This is admittedly cheesy, but I have fond memories of eating at Macaroni Grill in college nearly every other week, and there’s no Macaroni Grill near me anymore. (Funny what you get nostalgic for…I also have strange fondness for Fuddruckers because of college, too.) So I had myself a long, leisurely breakfast, egg scramble with coffee, toast, the whole bit, reading a magazine and looking forward to my trip, making my way to the gate just in time to board. Only my trip was delayed, as flights often are. I waited and waited, along with many others, and then I got hungry again. It was still dreadfully early, so I got…another breakfast. (Lugging a large carry-on always speeds my metabolism.) Nothing big, just some oatmeal and fruit to tide me over till the flight boarded. It was surprisingly delicious, with lots of maple syrup and fruit and nuts and just a bit of cream, too. So good! I was feeling content when we finally boarded, and feeling even better when I realized I had a WHOLE ROW to myself to stretch out in. I read magazines, leafed through books, listened to music, enjoying the time thoroughly and lost in my own happy world — when I was interrupted by the meal service: French toast, sausage, fruit, coffee. Another breakfast? How lucky was I? The rest of the flight was long but uneventful. I flew into Heathrow, made it through Border Control, got on the tube in the swing of a Saturday night and sat next to a group of Bosnian steampunks. (The best kind, I assure you.) I got to my hotel, and the kind people at reception upgraded me to a double suite — again, how lucky was I? Feeling very grown-up and fortunate, I took a nice, long shower, looked at room service and discovered they had an all-day breakfast. 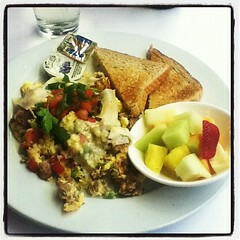 Naturally, that’s what I ordered: poached eggs, fruit, some granola and yogurt. Because what is more comfy than breakfast, especially when it comes on a cart with nice silverware, and you can eat it in a fluffy robe? I always said breakfast was my favorite meal of the day, because there’s just something so warm and lovely and mellow about a nice morning meal. Nothing makes me happier, foodwise, than a leisurely morning with some great coffee and a really hearty omelet. The only thing perhaps better is a nice stack of pancakes after a late night out. As much as I love a sophisticated gastro-pub (and believe me, I do), my heart will always belong to an all-night diner that serves breakfast at all hours. So 2011 really did fulfill my ultimate culinary fantasy: a day of breakfasts. A very long day of them!